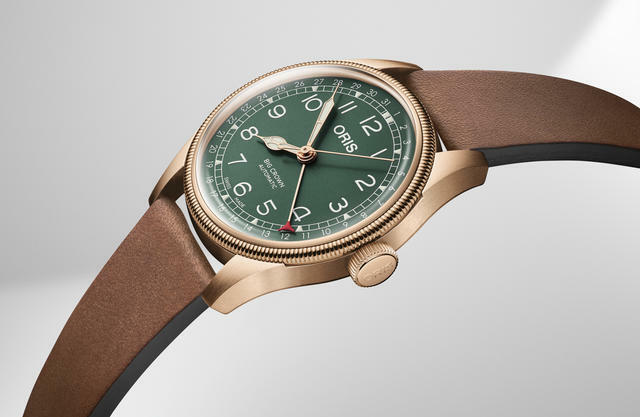 Oris celebrates the eightieth birthday of one of its best-known models, the Big Crown Pointer Date, by offering a special green-dialed, bronze-cased version called the Oris Big Crown Pointer Date 80th Anniversary Edition. The anniversary piece builds on Oris’s already successful integration of bronze-cased watches during the past few years. 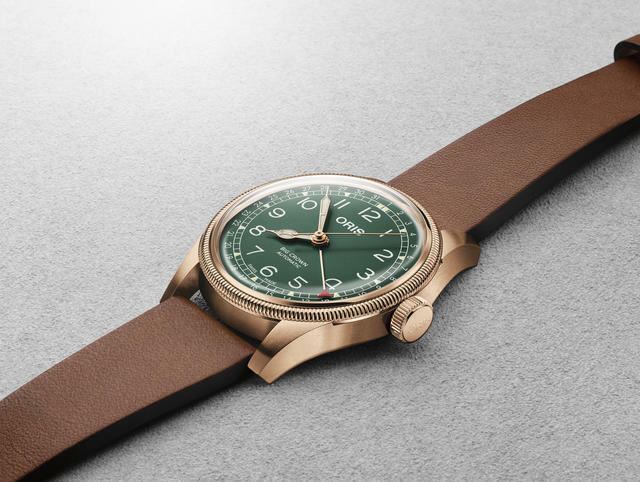 The new model offers a 40mm bronze case with the watch’s well-known fluted bezel and large crown, all framing a particularly handsome green dial. Oris reminds us that this case, like all its bronze cases, will patinate naturally as the watch is worn, giving each watch a personalized character. Inside is Oris’s Sellita-based automatic Caliber 754. An Oris Big Crown Pointer Date from 1954. Oris debuted the aviation watch in 1938 with an oversized crown so that gloved airmen could easily adjust it. Oris also added what was then an unusual complication – a date indicated by a central pointer hand. 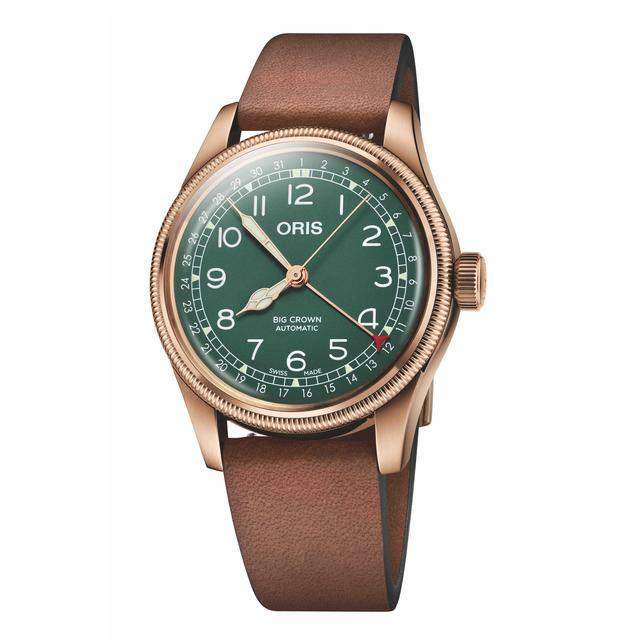 The watch became one of Oris’s best sellers. 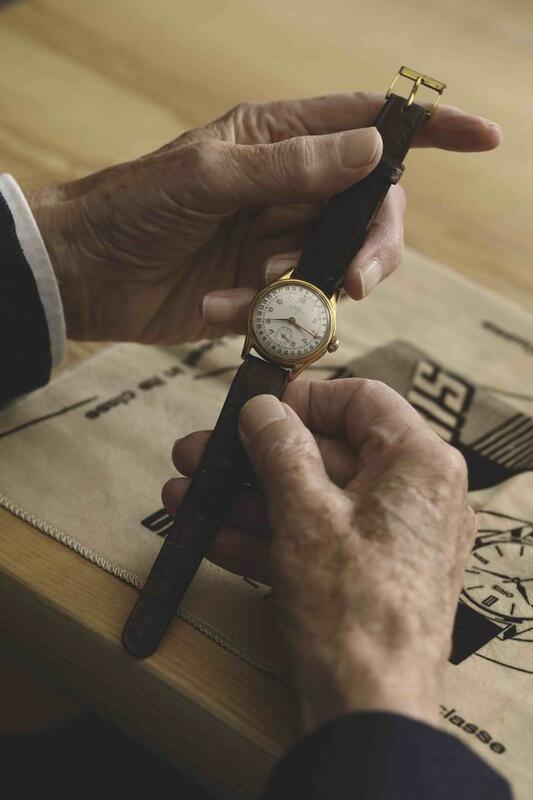 Production of the Big Crown Pointer Date continued into the 1960s, when Oris became among the largest watchmaking companies, at one time employing 800 people and producing 1.2 million watches and clocks a year. The Big Crown Pointer Date was also a critical design as Oris was recovering from the so-called quartz crisis of the 1970s, when low-priced quartz watches dominated sales and drove many makers of mechanical watches to bankruptcy. Sales of the watch were instrumental to Oris as it recovered in the late 1980s, according to Oris Co-CEO Rolf Studer. Price: $2,000. Case: 40mm multi-piece bronze, fluted, with sapphire front and mineral back. Screw-in security crown. Fifty-meters of water resistance.